Southwest Grill, a larger production area telegraphs the “fresh” message while boosting efficiency for on- and off-site sales. In a time where many multiunit chains are shrinking kitchens, Moe’s has gone in the opposite direction. 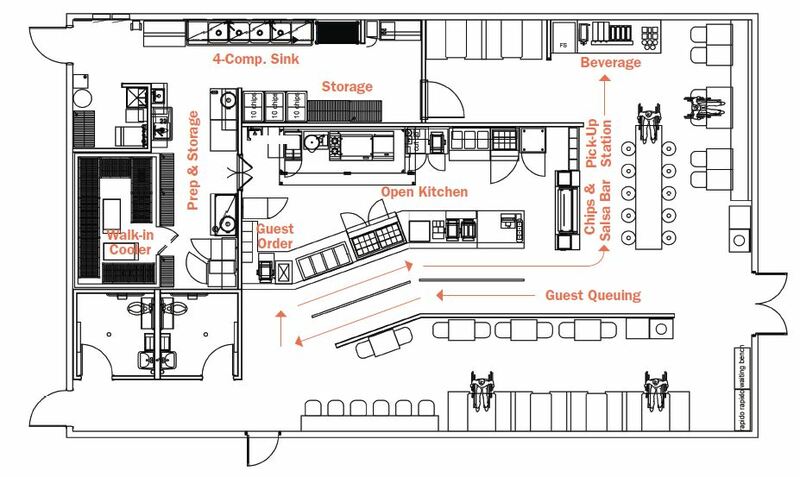 Its prototype and test restaurant, The Oasis, which opened November 2018 in Kennesaw, Ga., features a display kitchen that’s about 14% larger than the display kitchen of the previous prototype. In addition, the prototype sports a second makeline dedicated to carryout and online orders, a double-wide queue line and fewer seats. 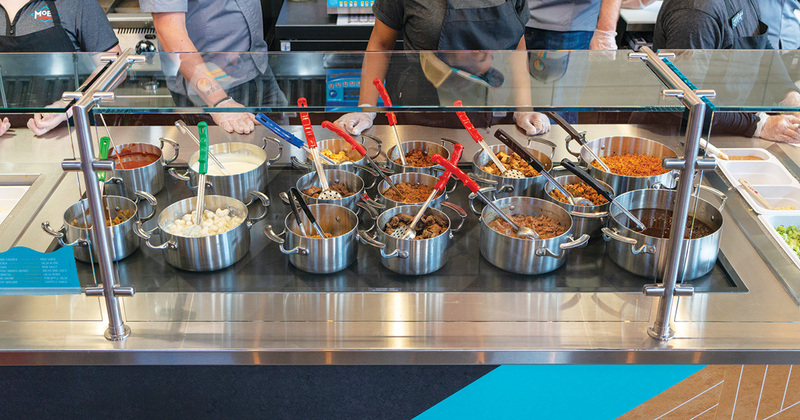 That, plus an expanded self-serve chips-and-salsa bar and a colorful interior design package, dubbed “Untamed Southwest,” aim to capture the attention of Moe’s guests and franchisees alike. Moe’s design team included Ashman as project lead, Lauren Taliaferro, Director of Design, and Karen Bustios, Director of Operations. 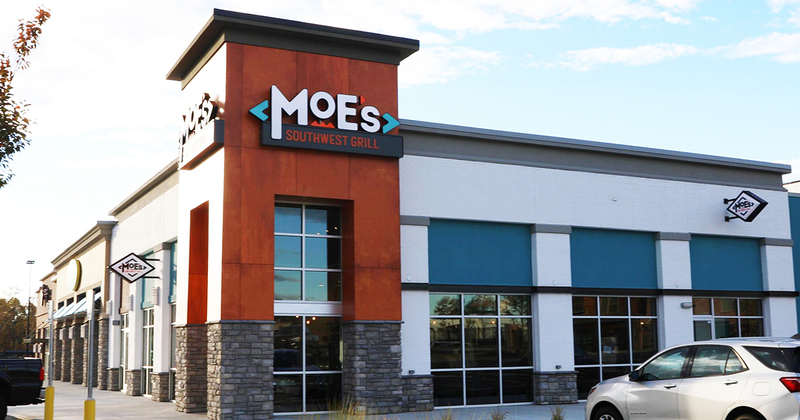 The Moe’s team worked with Sterling-Rice Group, Boulder, Colo., to develop a marketing direction, and GPD Group, Atlanta, for architectural plans. 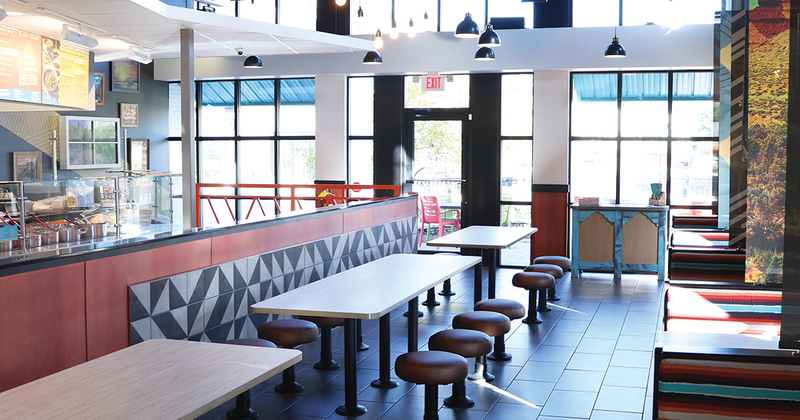 At Moe’s Southwest Grill, a new interior design package captures the attention of guests and franchisees alike with bright colors and whimsical graphics. Although the building footprint is about the same as earlier stores, the number of seats was reduced in favor of a larger food production area. A designated station for online orders helps streamline pickup. Designers added a pickup station at the end of the makeline and at the front of the restaurant. “It keeps those picking up online orders from walking through or waiting in the dining area, which makes for a better experience for in-store guests,” Taliaferro says. Employees bag, label and stow completed to-go orders in a pickup cabinet adorned with a metallic cactus sculpture (“just for fun,” Ashman says). The cabinet can hold about 22 orders. The seating area (shown here at the Sandy Springs, Ga., location) includes two-tops, banquettes and community tables with bolted-in stools. Designers tweaked Moe’s equipment package to enhance both appearance and efficiency. “We’ve seen about a 5% uptick in service speeds at our remodeled store,” Ashman says. Along the front makeline, the Queso Cantina area has a new “home on the range” look. Instead of drop-in hot wells, hot toppings are displayed in pots of varying sizes atop a heated shelf. The Queso Cantina section of Moe’s makeline enjoys a “home on the range” look with pots displaying hot ingredients on a heated platform. 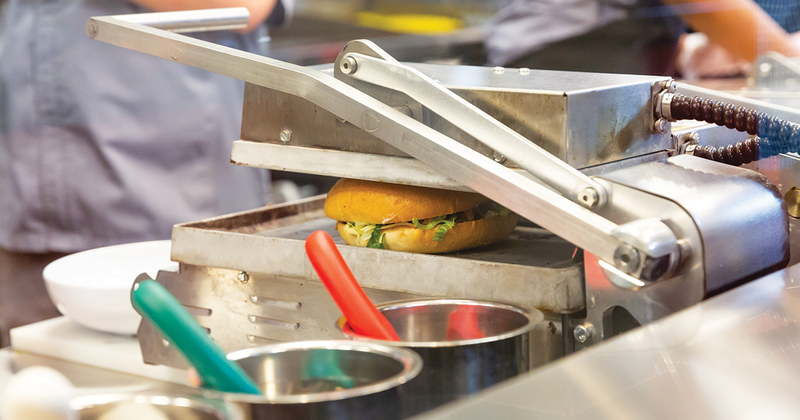 A sandwich press on the cookline pleases guests who prefer their bread toasted. The self-serve salsa bar, dubbed “Land of the Free,” gained shelving for pre-bagged chips on either side. This change has helped Moe’s earn credit from guests for freshness. The change also boosts throughput now that workers no longer have to bag and place chips with each order. And its location close to the serving line makes it easier and faster for workers to service. 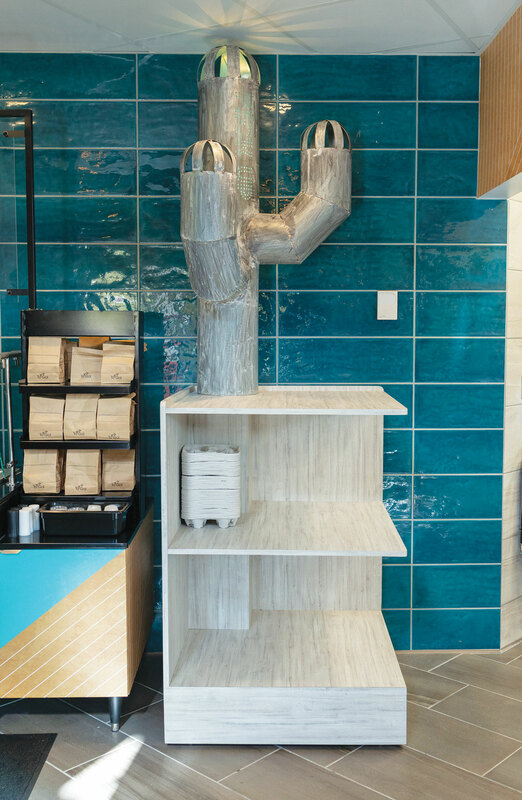 Back-of-house changes include the addition of a reach-in freezer as well as a warewashing area to handle the new-to-Moe’s reusable melamine servingware. Guests can blend tea with flavors at the beverage station. Although the building’s 2,600-sq.-ft. footprint is about the same as earlier stores, the larger production area left less space for seating. The Oasis can seat 70, compared to up to 90 seats at existing restaurants. “Since the trend is toward online, we were comfortable losing some seats to allow for a better experience for both the in-store guest and online customer,” Ashman says. Moe’s branding, with its color palette in shades of white, turquoise, orange and rust, resulted from a partnership with Sterling-Rice Group. The look captures the essence of the Southwest’s textures and experiences. On an accent wall near the entrance, interspersed with other framed artwork and brand messages, a flat-screen monitor—decked out to resemble a wood-framed window—airs video snippets of Southwestern scenes. 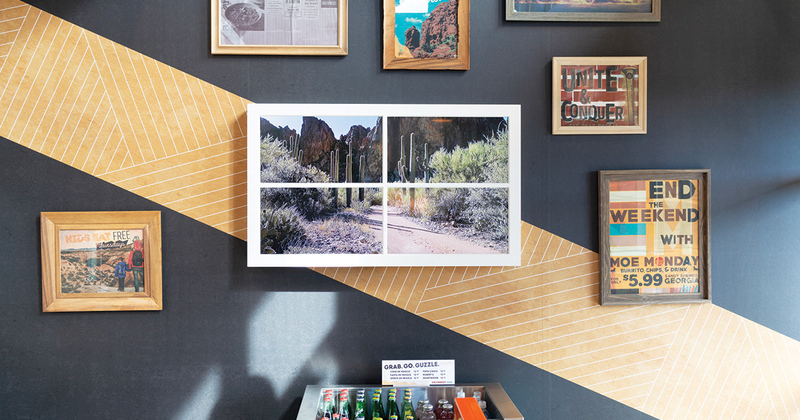 An accent wall features a wood-framed flat-screen monitor running video clips of Southwest scenes. The seating area is a mix of banquettes, two-tops and a community table with bolted-in stools. Designers seemed to have extra fun with the banquettes. The seat backs boast fabric that evokes Native American blankets. Adding visual separation between booths are printed fabric panels, with artwork of stylized cacti or other Southwest scenes. 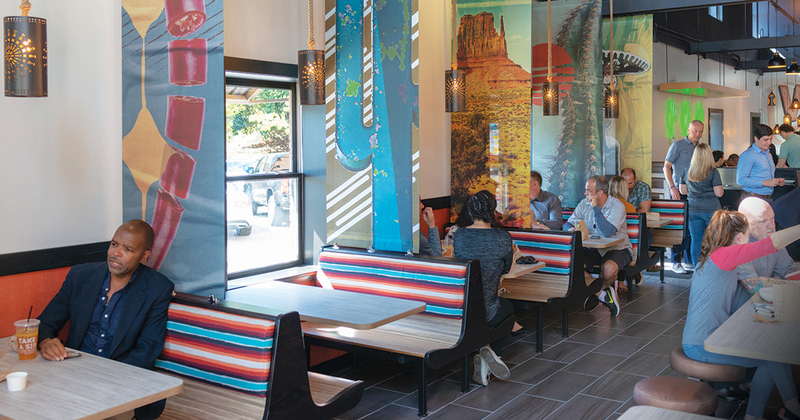 Moe’s colorful interior and exterior encompasses Southwestern textures and experiences. The building’s exterior features a tower finished in rust-colored Corten steel. Stone look-alike cladding surrounds the tower’s base, while turquoise-colored panels above windows complete the look. 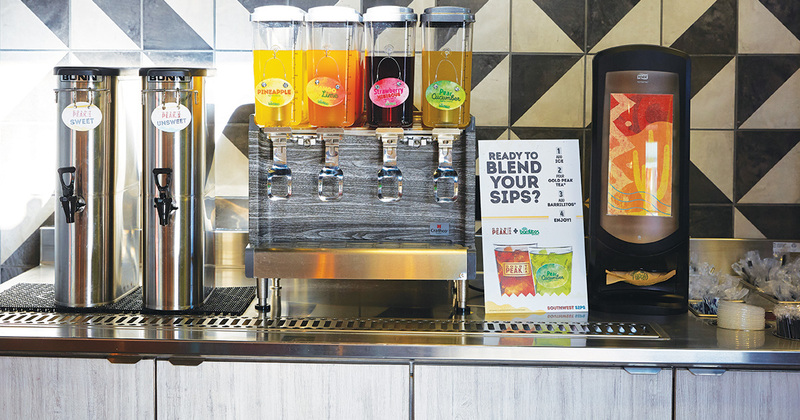 Moe’s and Sterling-Rice Group collaborated on a “kit of parts” that allows franchisees to choose finishes and fixtures that best meet their individual budgets. PROTOTYPE SIZE: 2,600 sq. ft.
CONSULTANT/DESIGN FIRM: Sterling-Rice Group, Boulder, Colo.
Hoshizaki u/c refrig., worktop refrig. Hoshizaki ice machine, storage bin, worktop refrig.